Do you practice fire safety in your home? Do you have an escape route planned? What about for your pets? One of the most horrific experiences a family may have to face is watching their house go up in flames. Losing one’s home and possessions to a fire is devastating, but it will be much worse if you lose your beloved pet in the flames, too. You need to plan in advance. Do it today! Make an escape route that includes your pets. Most of us have discussed with our family members what to do if a fire breaks out. We teach our children how to escape, where to meet us outside, and to never ever re-enter the home under any circumstances, but rather to wait for the fire department to come and assist the family. Fire alarms, smoke detectors and/or carbon monoxide detectors to alert us there’s a problem. And after all of this, did we remember about our pets? Most pets become confused and frightened during such a traumatic event like a house fire and look for help from their owners. They don’t know where to go and some hide making it virtually impossible to find them through the smoke. Did You Know........? 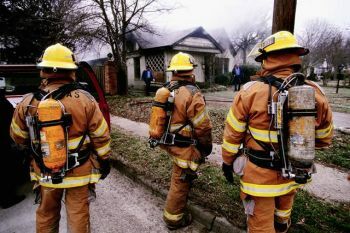 Research shows that the main reason dogs perish in home fires is due to the fact that are not able to escape on their own. It could be because they are confined in a crate or kept in another room behind closed doors with no way of accessing an exit of their own. If this is the case in your home here are some tips to help you be better prepared at getting your dog out alive! Practice your escape route with your dog. Record a fire alarm alert and play it for all family members to begin practicing for an evacuation. Train your dog during fire safety practices on what to do and how you want him to react to the noise and commotion. Even if he won't remember during an actual fire, the rest of the family will be better prepared to getting your dog out safely. If your dog is usually confined to a separate room, think about installing a doggie door for him to have a way to escape on his own. If you keep your dog in a crate, rehearse how you will get him out. And be sure to have pet alert stickers in place so rescuers know that you have pets inside and they need help. Especially important to have in place for when you are not at home and the unthinkable happens. In fact, if you live in a multi-level home, it's a good idea to keep your Miniature Schnauzer on the ground floor when you are not at home so your dog is easier to get to and rescue. Besides practicing the evacuation, there are other fire safety considerations like where you will go when it's all over? If you must go to an emergency shelter, keep in mind they don't all except pets. If you aren't able to keep your dog with you, where will he go? An animal shelter? A boarding facility? Consider having in place a friend or family member who is willing to keep your dog in their home for a couple of days should disaster strike. Have your dog's first aid kit stocked and ready to go. Make sure you have food and fresh water; an extra collar, leash, and ID tags; any medications emergency contact numbers ~ Vet or animal hospital, as well as his medical records. note: Most animal shelters and kennels will want to see proof of vaccinations. The best way to keep your family and your pets safe during the chaos of a fire evacuation is through preparation and practice. Prepare a fire safety plan and practice it with everyone in your family and that includes your dog. 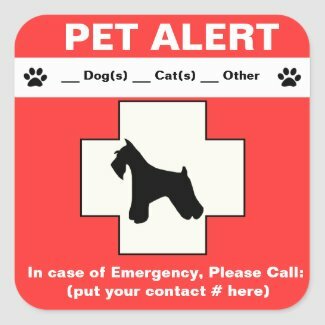 Be sure to have Emergency Pet Alert stickers on both front and back side windows of your home. This particular sticker is our version and you can customize it any way you want. 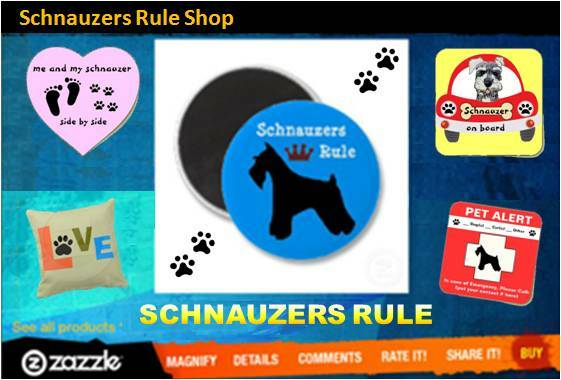 You cand change the wording, size, shape, add your Schnauzer's photo or whatever else you like. And it's always a good idea to be ready to handle minor emergencies yourself with a pre-made first aid dog kit. • Extinguish open flames - Pets are generally curious and will investigate cooking appliances, candles, and even fires in your fireplace. Ensure your pet is not left unattended around an open flame and make sure to thoroughly extinguish any open flame before leaving your home. • Remove stove knobs - Be sure to remove stove knobs or protect them with covers before leaving the house. According to the National Fire Protection Association, a stove or cook top is the number one piece of equipment involved in your pet starting a fire. • Invest in flameless candles – These candles contain a light bulb rather than an open flame, and take the danger out of your pet knocking over a candle. Cats are notorious for starting fires when their tails turn over lit candles. • Beware of water bowls on wooden decks – Do not leave a glass water bowl for your pet outside on a wooden deck. The sun's rays when filtered through the glass and water can actually heat up and ignite the wooden deck beneath it. Choose stainless steel or ceramic bowls instead. 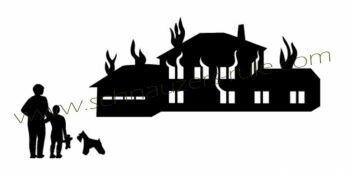 The National Fire Protection Association urge pet owners to get window decals or stckers for their home. Be sure to write the number of pets on it so that fire/rescue crews can see it. This critical information saves rescuers time and can save your pet's lives. Make sure to update the number of pets listed in your household. "Knowledge Share"... If you found this page on Fire Safety helpful and informative, please share it with your dog-loving friends by clicking on one of the share links (like facebook, twitter, and google +1) located at the top right or bottom of this page.